Updated Toy Story Land concept art has appeared on construction walls in Disney’s Hollywood Studios. 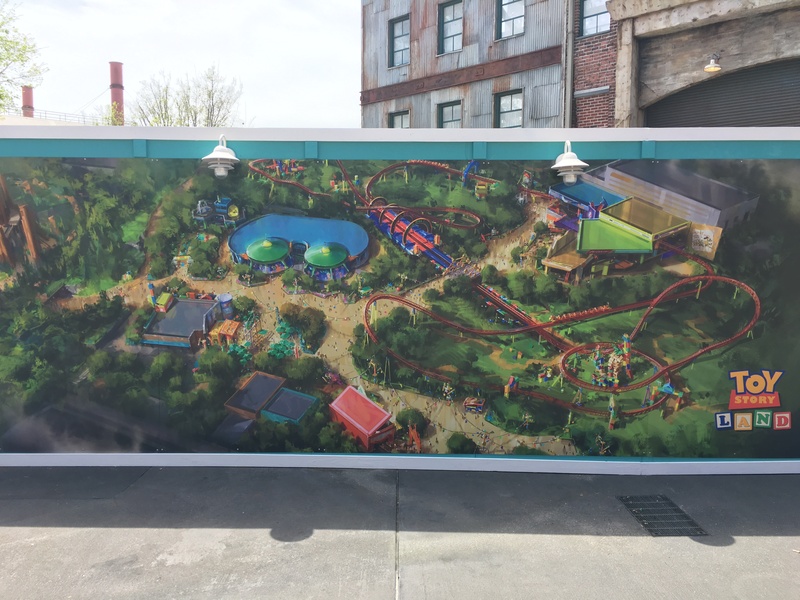 Just days ago, large portions of Disney’s Hollywood Studios disappeared forever, and shiny new construction walls appeared in their place, along with new updated Toy Story Land concept art that reveals what a portion of the park will look like in a few years. After Walt Disney World retired the Streets of America and Lights, Motors, Action! stunt show (click for Video) over the weekend, they swiftly erected new barriers around the park to prevent guests from entering the former New York backlot areas until new attractions debut in several years. 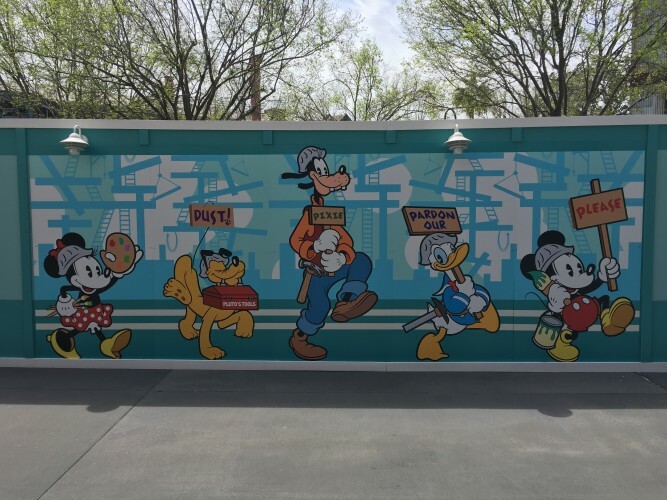 In the meantime, those new construction walls feature some updated artistic impressions of what Toy Story Land will eventually look like. 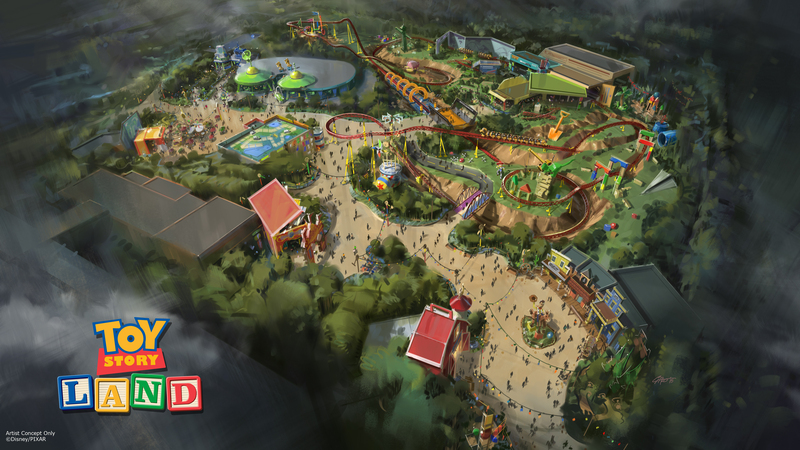 Disney’s original 2015 concept art for Toy Story Land at DHS. While not radically different at first glance, if you compare it carefully to the new artwork at the top of this article you’ll spot some changes, both subtle and significant. Most significantly, the Slinky rollercoaster appears to have been greatly simplified. Originally, the track was to run through trenches dug down into the ground, and make dramatic turns under and above multiple guest walkways. Those elements appear to have been downsized in the updated layout, with the coaster now running a more conventional path atop flat terrain. Modifications have also been made to the queue entryway and decor alongside the track. • Some scenic elements – notably Pixar’s signature Luxo Jr. ball and a white bucket — have been eliminated. • A pair of structures with outdoor seating in the center-left of the first concept has been replaced by a single building on the second, and the board game theming on the roof was removed. • Hints of the entrance to Star Wars Land now appear on the far left side of the image. • Al’s Toy Barn and the Woody’s Round-Up ride no longer appear on the art, but that may simply be a case of them cropping the image along the bottom to fit the shape of the construction wall. • A mysterious path on the left side now leads up off the image. Could it lead to yet another future expansion on the land once occupied by Catastrophe Canyon? 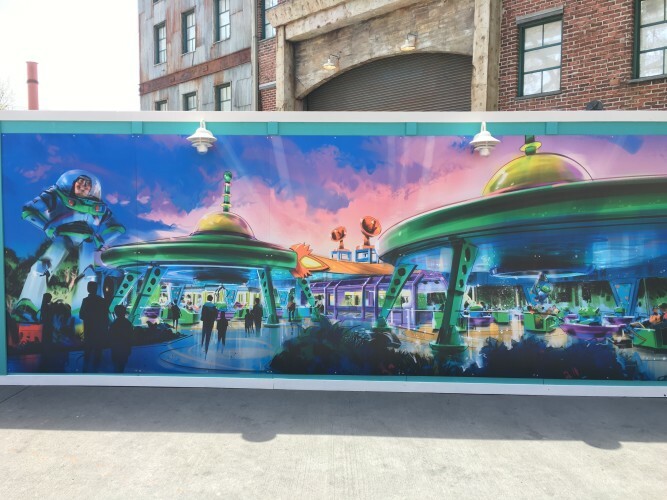 Disney has also posted this previously-released concept art of the Little Green Men spinner ride. It isn’t clear from the artwork if this attraction will be based on the technology used by Luigi’s Rollickin’ Roadsters or Mater’s Junkyard Jamboree at Disney’s California Adventure, but don’t be shocked to see some Cars Land ride systems adapted for Toy Story Land. Keep your eye on Attractions Magazine for further updates on the exciting future of Disney’s Hollywood Studios. Pardon our pixie dust! This image was originally used on construction walls in Disney’s California Adventure during that park’s massive makeover.